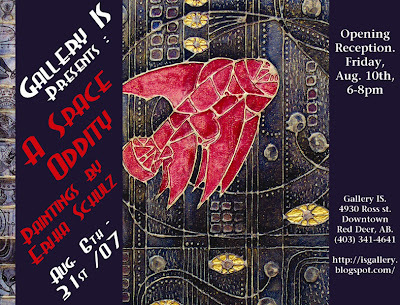 "A Space Oddity" is the result of Erika's love for science fiction. At an early age Erika was a fan of Star Trek. Her appreciation for the sci-fi genre has grown with her and now she finds great inspiration in the movies, television, and liturature of sci-fi. Please visit the gallery between Aug 6th and Aug 31st to view this collection of over 20 all new paintings. Some of the highlights include a zodiac series, a city of the future, robots, and many, many rockets. These works are done in Erika's unique "drawing with paint" style. The opening reception is set for Aug 10th, 6-8 pm. Drinks and munchies available. The artist will be in attendance. Everyone is welcome. Admission is free.